I don't like snickerdoodles, but it doesn't even matter! 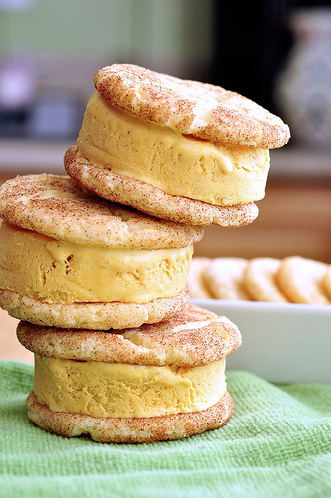 These snickerdoodle pumpkin ice cream sandwiches still look amazing. Pennies on a Platter shares a tutorial on how to make them and the recipes for both the ice cream and the cookies on her blog. I didn't think it was possible to be more excited about Fall than I already was, but I was wrong! I can't wait to make these with molasses cookies. You can see the tutorial for making the ice cream sandwiches HERE, get Nikki's pumpkin ice cream recipe HERE, and get her snickerdoodle recipe HERE.